Discussion in 'iPad General Discussions' started by iDan, Jan 28, 2010. Apropos of Iâ€™m not sure anything, the screen on this thing, at 1024x768, has an aspect ratio of 4:3. Chairman Gruber opined on Twitter a month ago (speaking of his iPhoneâ€™s video camera), â€œWho wants 4:3 video nowadays?â€ And I have to admit, my expectation for the iPad (pause for giggle, pause for mental image, pause for shudder) was that as time went on, our screens would get closer to 16:9, not further. But it was clear in the deviceâ€™s orientation when Steve first pulled it out, and in the orientation of the Apple logo on the back, that the iPad (â€¦) is meant primarily to be used in portrait mode, that its function as a video device is really secondary to its function as a reading device. And 9:16 is now, and will probably always be too damn skinny for a screen. 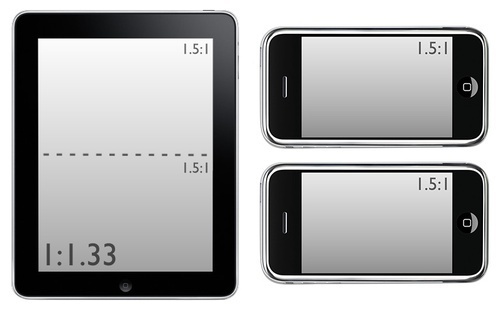 As you can see above, an iPad screen in portrait is equivalent in aspect ratio to two iPhone screens stacked in landscape mode. What does this mean? Put two and two together, man. Do I have to spell it out for you?